Blurb Description: Eleven-year-old Malcolm Polstead and his dæmon, Asta, live with his parents at the Trout Inn near Oxford. Across the River Thames (which Malcolm navigates often using his beloved canoe, a boat by the name of La Belle Sauvage) is the Godstow Priory where the nuns live. Malcolm learns they have a guest with them; a baby by the name of Lyra Belacqua . . .
1. I fell in love with Malcom, the main character in this book, by the time I had finished the second chapter. He was this PURE SOUL with an INQUISITIVE MIND and a HEART OF GOLD and I loved his story SO MUCH. 2. I also LOVED Malcom with Lyra. In La Belle Sauvage, Lyra is a mere infant, only a few months old and it shows you the story of Malcom’s connection with her and all about how Lyra ended up at Jordan College, which is where The Golden Compass opens ten years later. 3. I should warn you that the pace of this book is slow. If you’ve read Philip Pullman’s previous works, you already know what I’m talking about, but just in case you haven’t, it’s always better to be prepared. 4. I loved how this book contained SO MANY CHARACTERS we’d seen in the His Dark Materials trilogy. I probably didn’t remember some of them (blame the memory of nine year old me) but the ones I did, I had FANGIRL moments over. It was AMAZING to see everyone before Lyra’s story and see the pieces of Lyra’s circumstances come to be. 5. I didn’t remember much about the workings of the Althieometer from when I read The Golden Compass, but the way it was explained in La Belle Sauvage was stunning. I felt like I was there, in the midst of the scholars that were talking about it and absorbed everything as best as I could. 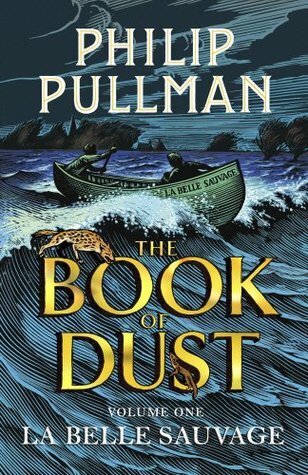 A beautiful new installment into Philip Pullman’s breath-taking world that I HIGHLY recommend diving into. In 2007, the first novel of the "His Dark Materials" trilogy was adopted into the motion picture "The Golden Compass" by New Line Cinema. Have you read the His Dark Materials Trilogy or watched The Golden Compass? Have you read La Belle Sauvage? What did you think of it?